Warner Bros. has made the right choice by bringing the Harry Potter franchise to 4K UHD and providing a more crisp and detailed viewing experience than we have been privy to in the past. Warner Bros. has been amazing moviegoers over the last few years with their movie content, storylines, and choice of cast. In the last year, they have also shown incredible foresight into bringing some of their prior blockbuster releases into the new digital technology. The Harry Potter franchise has enthralled kids and adults of all ages- from books, to apparel, to major theme parks, to movies, and beyond the imaginable. 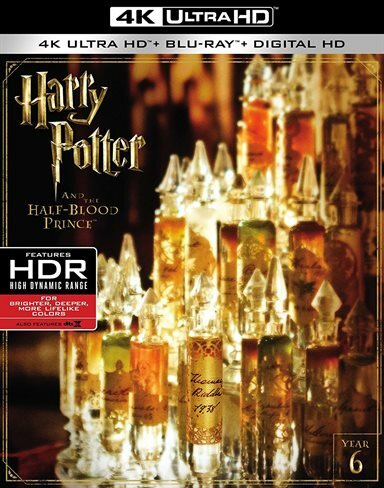 Now, with 4K video technology, Warner Bros. has brought the magic of Harry Potter back to our homes with the revitalization of the video and audio. In the sixth installment of this famous franchise, J.K. Rowling continues the darker version of the storyline from the fifth installment. Professor Dumbledore (Michael Gambon; The Casual Vacancy) has taken his rightful place at the helm of Hogwarts and seems to be on a quest to protect Hogwarts and continue Harry Potter's (Daniel Radcliffe; Harry Potter franchise) education on defeating Voldemort (Ralph Fiennes; A Bigger Splash). As Death Eaters come out of hiding, Harry is even more suspicious of Draco Malfoy (Tom Felton; The Flash) pinning him as a Death Eater, as two indirect attempts on Dumbledore's life are made. Throughout this, many changes occur at the school, with Snape (Alan Rickman; Die Hard) finally obtaining the coveted Defense of the Darks Arts teaching position. Turns out, Snape is as formidable in this position as he was as the Potions professor but while he was the Potions master, Snape seemed to take great pleasure in pointing out Harry's deficiencies in that subjection. When Harry starts excelling in Potions under Professor Slughorn (Jim Broadbent; Moulin Rouge! ), Snape becomes very suspicious. Harry's potions book is replete with suggestions deviating from the actual formulas and unique spells and the quest begins to find out who the Half-Blood Prince was the former owner of the book. Snape's suspicions of Harry are solidified when Harry uses one of the spells from the book on Draco. Meanwhile, Voledemort is strengthening in power and in numbers, tightening his hold on both the Wizarding World and the non-Wizarding World. In order to continue trying to find a way to defeat Voldemort, Dumbledore continues to push Harry to a level of higher wizarding in a very non-traditional way. Unfortunately, it is apparent that while Harry has been told some secrets, there are still many more secrets that remain unveiled. Because of the Dumbledore's lack forthrightness, Harry witnesses the penultimate sacrifice without a real understanding of why it happened or what really happened. Harry Potter and The Half-Blood Prince is the sixth film and book in the J.K. Rowling Harry Potter series. While other reviews comment that this is the film that deviates most from the book, I find that quite the opposite. Having read all the books (many, many times each) and enforcing the rule in my house that you cannot watch the movie until you read the book, I quite think that Harry Potter and The Half-Blood Prince does a rather good job at covering most of what needs to be covered. Yes, details about Snape's background are left out and while I would have loved to have seen the softer side of Snape brought to the big screen, Director David Yates (Fantastic Beasts and Where to Find Them) did a spectacular job, along with J.K. Rowling, of taking a book that was over 600 pages long and keeping it to a realistic length, while making sure the story was kept intact. Maybe once Rowling and Warner Bros. completes the Fantastic Beasts franchise, we can implore them to write Snape's backstory and bring it to the big screen. The 4k UHD video has a 2.39:1 theatrical aspect ratio. While originally shot in 2K with the opening scenes in 3D, the video quality is exceptional. Again, one of the best marketing techniques by Warner Bros. is to release these blockbuster hits in the superb 4K video quality, bringing depth perception and clarity to scenes otherwise that weren't as real feeling or clear. The color difference between the HD Blu-ray and the 4K UHD is subtle but noticeable. Included is a second Blu-ray disc, the 1080p HD which is the same disc that was released with the Ultimate Collector's set. The audio is presented in English DTS:X. Without a sound system, you may not hear the actual difference in the audio. Regardless of having a sound system or not, the sound is clearer, especially when it comes to special effects. Warner Bros. does a wonderful job upgrading the sound quality for just an overall better listening experience. Warner Bros. has made the right choice by bringing the Harry Potter franchise to 4K UHD and providing a more crisp and detailed viewing experience than we have been privy to in the past. Harry Potter and the Half-Blood Prince film may not provide as much background about Snape, as the book does, but Yates and Rowling created a streamlined version that can be appreciated by everyone without feeling like there is something missing. Download Harry Potter and the Half-Blood Prince from the iTunes Store in Digial HD. For more information about Harry Potter and the Half-Blood Prince visit the FlickDirect Movie Database.